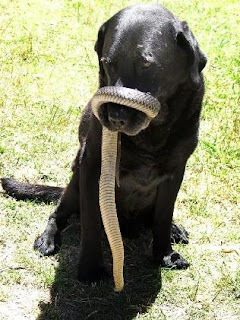 Today's news stories about Victorian labrador Bronson's brush with a deadly snake is a good reminder that Summer brings snake dangers for many Australian pets. According to news reports, Bronson, a champion obedience dog returned home from a run on the family property on Jan 4, with a deadly Copperhead locked firmly in his jaws and coiled around his snout. Bronson's quick thinking owners found a chaff bag and lowered the snake to the ground, pulling the bag up and over the snake while at the same time releasing its body which remained wrapped around Bronson's snout. The well trained dog did not release the snake until commanded to "drop" by his owner. Blood tests at the near by West Gippsland Veterinary Centre confirmed Bronson had received a bite but thankfully after four days of treatment in hospital Bronson is now happily at home. The Australian Veterinary Association (AVA) has once again warned that an alarmingly high number of pets had been brought to clinics this summer for treatment of snake bites. The AVA advised that snakes tend to be at their most active towards the end of day, with snake bites usually happening in late afternoon or early evening and warned that dog owners should avoid snake-prone areas. Symptoms of snakebite include seizures, vomiting, bleeding around the bite, weakness in the limb and paralysis. The animal may collapse with laboured breathing. In cases of snake bite, urgent treatment is needed but make sure you call ahead to your veterinarian or emergency veterinarian centre, so they have antivenene on standby. Happy that Bronson survived. We had no clue to expect red bellied blacks in our newish backyard in the Blue Mountains, just as, the weather warmed up. Lucy, our 10 year old dog, was just too curious. Some blue tongues survived her curiosity, some not (WIRE and local vets very appreciated). Lucy, our beloved doggie, did not survive the snake. I hope that more animal lovers can be aware of the dangers and sypmtoms.